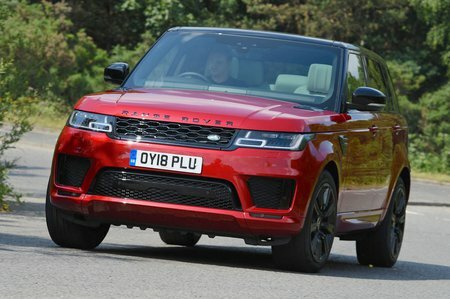 Land Rover Range Rover Sport 2.0 P400e HSE 5dr Auto 2019 Review | What Car? What Car? will save you at least £1,803, but our approved dealers could save you even more. The PHEV P400e combines the Si4 petrol's 296bhp with a 114bhp electric motor to give a healthy blast of pace when you put your foot down – although not quite enough to match the Volvo XC90 T8 hybrid – and a quiet, electric-only range (of around 20 miles in the real world) when you use it in EV mode, which can be maintained at speeds up to 85mph. It's a little clunky at times as it switches between engine and motor, but the regenerative brakes work relatively smoothly. It's superb for those who mainly drive in town and can keep the battery charged (which takes around 2hrs and 45mins from a 32amp wall socket, or 7hrs 30mins from a standard three-pin plug), but once the batteries are depleted, the best average mpg you'll see will be around 25mpg.